Actually this cake is 100% vegan if I had used vegan chocolate chips. I had 2 big zucchinis in my fridge and was wondering what to do with it. Coincidentally I saw a recipe for chocolate zucchini cake in one of the cookbooks I have. I was not surprised because I’ve baked a chocolate chip zucchini bread earlier and I know that you cannot taste the zucchini at all. But I didn’t want to proceed with that zucchini cake recipe because it was a 4 layered birthday cake with frosting and all. I wanted something very simple, like a snack cake. Googled and found a couple of zucchini cake recipes. 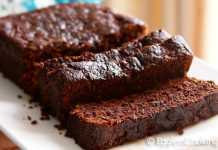 I decided to go with this chocolate zucchini cake recipe because it was very simple and it also gave me room to make some healthy changes. I used Ener-G egg replacer powder instead of eggs. This is my 4th attempt with Ener-G. My first experiment was not that good but the remaining 3 came out very well. I will post the other 2 recipes shortly. 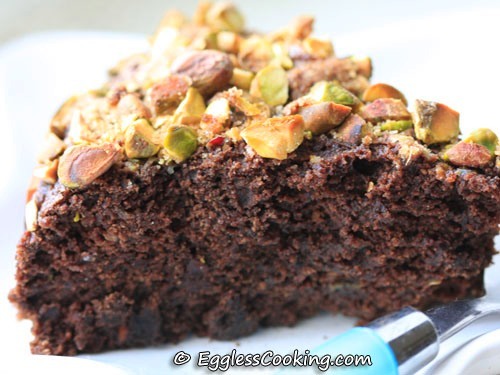 For this chocolate zucchini cake I kept the original measurements same but changed the ingredients to make it as healthy as possible. Like using whole wheat pastry flour instead of all purpose flour, oil and applesauce instead of butter, 1/2 cup of mini chocolate chips instead of 1 cup semi sweet chocolate chips. You can take my word that this cake is absolutely delicious in spite of all these healthy substitutions. My son (most of you know that he is a very picky eater) enjoyed this cake very much, not only on the first day but until it got over. This cake is not light and fluffy but dense and moist. 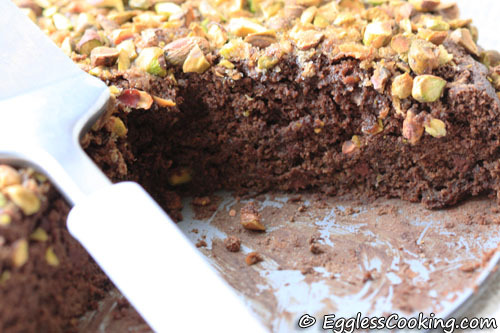 This chocolate zucchini cake is also not overly sweet. Unlike the cakes made with all purpose flour and rich frosting which increases your sugar craving and makes you grab another slice of the cake, this cake is very filling and satisfying. We were not able to locate even one strand of the shredded zucchini. This is not your usual chocolate cake. 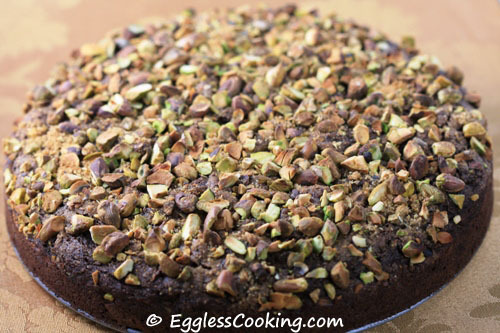 Grated zucchini makes this cake moist and whole wheat pastry flour makes it very healthy. Preheat oven to 360F/180c for 15 minutes. Grease and flour a 9 inch spring-form pan. You can use cocoa instead of flour. In a large mixing bowl sift together the flour,cocoa, baking soda, baking powder and salt. In a small blender/processor blend together the Ener-G and water until it’s nice and fluffy like beaten eggs. I used my Magic Bullet blender. I pulsed it a couple of times. In a medium bowl add oil, applesauce, sugars, vanilla extract and coffee powder. Using a hand mixer beat the mixture in medium speed for 3-5 minutes. Add the egg replacer liquid in 3 additions beating it after every addition. Now also add the milk and beat until well combined. Reserving half a cup of the flour mixture, add slowly the remaining flour to the wet ingredients, while beating it in low speed. 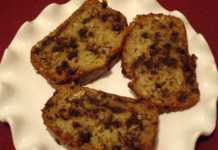 Combine well the grated zucchini, chocolate chips and 1/2 cup of flour. Add this to the batter and mix it well. Note that the batter is thick at this stage. So don’t worry. Pour the batter in the prepared cake pan and smooth it out using a spatula. While using a spring-form pan it’s advisable to place the pan on a baking sheet, so that the batter or baked cake does not fall down if the pan is not locked properly. Prepare the topping by mixing the brown sugar and pistachios. Sprinkle this mixture evenly on the batter. Bake for 40 to 50 minutes. Mine was done in 45 minutes. The key in using Ener-G is processing it with the water in a blender until it’s nice and fluffy. Simply whisking it with a fork does not give desirable results. If you pour this immediately in a liquid measuring cup, you will see that it measures exactly 3/4 th of a cup, which is perfect because we usually replace every egg with 1/4 cup of any egg substitute. But by the time I was ready to add this mixture to the rest of the wet ingredients, I saw that it had reduced to 1/2 a cup. So to replace the 1/4 cup of liquid missing I used unsweetened soy milk. You could use any milk or even some fruit juice which you think would go with the flavors you are baking. You can also use an 8 inch or 9 inch round cake pan instead of a spring form pan. But I think you cannot do the topping because, while inverting the pan to unmould the cake the toppings may fall down. Zucchini can be grated without peeling. After grating I felt that the strands were very big, so I chopped them coarsely. This goes to the Egg Replacement Event – Egg Replacer Powder hosted by me. 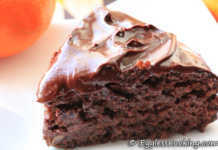 Mam I am presitha i have previously tried ur eggless chocolate cake it was awesom. I just have a doubt can i substitute apple cider vinegar for Apple sauce. Thanks Presitha. No it won’t work. I thought of trying this recipe because I am a health conscious person. I don’t have unsweetened apple sauce, can I substitute it with the same amount of canola oil. You can substitute but it wouldn’t be healthy then. I tried this for the first time, also first time in oven. I set the temp to 350F and for 45 mins but when I tried to check it with knife. It was still sticky.. Did another 30 mins and was still sticky. Not sure for how long should I put it.. Substitute for egg recplacer? 3 teaspoon distilled vinegar? I want to make it for my mother in law. beside vinegar what else i can use ? This one was excellent. I used white wheat flour (my usual flour) and rice milk. The pistachios on top were a really fabulous touch. The salty with the sweet was great. I have extra shredded zucchini and I’m thinking of making another cake, without the topping, to put in the freezer for once school starts. Thanks. Wow! You are on a roll Jen. 3 recipes continuously! Thank you so much for trying the recipes and giving me the feedback. i just made this and it’s so delicious! my daughter has food allergies and it’s such a pleasure when I can make something she can eat that the rest of the family WANTS to eat. YUM! Thanks for trying the recipe Leah. Feedback for those who doesn’t have Egg replacement: You could try Vinegar 3 tea spoons along with wet ingredients. Sapna, I really appreciate you for taking the risk on a Valentine’s Day. I’m so happy that it turned out good and you liked it. Thanks for the feedback. I’m back again, after taking this one for a test drive tonight. Five-year-old Big Guy, known worldwide for his pickiness, just gobbled this. I was concerned at first, because I didn’t do a stellar job of peeling the zucchini and I was afraid he’d spot it. Nope. I think the chocolate blinded him. Whew! I baked mine in two layers, and it took 25 minutes at 350 degrees. I stacked and filled with chocolate buttercream, doing so while the cakes were ever-so-slightly warm so the frosting just melted. I then frosted the top only with the same. I didn’t do the sides because I ran out of frosting, but I’m glad I didn’t. I think that would have been too much chocolate for even Big Guy. Great recipe, Madhuram. It’s going into my keeper file. Wow Deb, that was very quick and thank you very much for trying this. I’m glad Big Guy liked it. Wawii..Madhuram u always surprises me with different varieties of eggless cake….Chocolate and zucchini!! !hope it taste wonderful. Wow…looks great,soft n fluffy.Super! Bookmarked! Thanks Nithya. Welcome to my blog. Belated new year and pongal wishes Madhu..I made ur zucchini bread long back..Sure this will also tasted grt..Love the pics. You too Kamala. Yesterday only I was thinking of you. Wanted to check your blog, but somehow couldn’t. looks really yuumy and inviting. I hope i get some from that cake..
wow.. looks so soft and fluffy. i wish i was your neighbor to taste all these yummy stuff. Thank you so much SM. Regarding the logo, were you able to understand that the egg and the strike depicts eggless? I’m getting mixed reviews. You are reading my mind! I was cleaning laundry out of my husband’s car yesterday (HOW that man accumulates so many clothes in a vehicle I’ll never know)and found some zucchini he’d bought but forgot to bring in. Luckily, it’s been cold, so they’re just fine. Problem is, I’d also bought zucchini at the store, so suddenly I had more of them than the year we planted “just a few.” You know how that turns out — a few is enough to feed the world. And now I know what do to with the bumper crop. Plus the jar of applesauce I’m sick of picking up after it falls from the refrigerator. I just have to “borrow” some instant coffee from a friend. I’ll admit, I’m a snob on that point. And make sure Big Guy doesn’t see me “ruining” his cake with zucchini. So thanks for this yummy-looking recipe. Can’t wait to try it! Sure, try it Deb. I assure you that he cannot locate the zucchini. That looks gorgeous Madhu. I was gonna make a zucchini choc cake as well. I’ll use your recipe. Lovely and perfect.I too was planning on zucchini with choco chips.And yet to buy the enrg egg replacer.Thanks for the note-they are helpful.